Readers on underreaction to avian flu, junk genes and sexism. I was sorry to see Proto, in its debut issue, add legitimacy to the long-standing but unsupported claim that evolutionary theory tells us that another influenza pandemic is unlikely (“Fearing the Flu,” Fall 2005). Though somewhat more nuanced than previous writing on this topic, the article is full of inaccuracies that add up to a downright irresponsible thesis. The article states that the virus that killed 20 million or more people in 1918 achieved its high virulence in the crowded trenches of World War I. While the influenza pandemic coincided temporally with the war, there is absolutely no evidence that the war caused its unusual lethality; indeed, the virus spread extensively in civilian populations without becoming benign. And contrary to the article’s claim that “when the war ended, the disease lost its virulence,” the influenza season of 1919–20 took an estimated 96,000 lives in the United States alone. While the annual death toll from the H1N1 “Spanish” flu strain did indeed decline over time, that decline is most likely attributable to the gradual buildup of immunity in the population rather than evolution of the virus toward a more benign form. The article also gets the science wrong. The claim that crowding or trench warfare is required to “heat up” the virulence of a virus relies on a set of scientific hypotheses that have been carefully tested and largely refuted. What’s more, the argument goes against common sense. The SARS virus, which was more deadly to infected people than even the 1918 virus, emerged without trench warfare. Indeed, it appeared in conditions similar to those in which, it is feared, the next pandemic flu strain might arise. How refreshing to read something well argued and level-headed about avian flu after the widespread nonsense we’ve been deluged with! Richard Thomas // Editor, World Birdwatch, Cambridge, U.K. 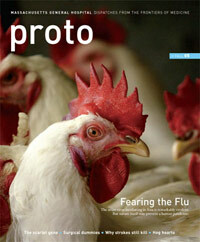 The Fall 2005 issue of Proto included two notices of genes affecting behavior. The first, cited in Advances , referred to recent research on the genetic basis for the mating behavior of voles. The other, in the “The Scarlet Gene,” referred to variation in a serotonin transporter gene that has been linked to depression. Interestingly, these two seemingly independent items are united by an inconspicuous commonality. David G. King // School of Medicine, Southern Illinois University, Carbondale, Ill. I thoroughly enjoyed the new Proto until I got to Post-Op. The reference to a “pretty Thai nurse” who “pouted” as she inquired about the patient’s discomfort was gratuitous and insulting. Write to protoeditor@mgh.harvard.edu to comment on a story—or offer suggestions for future topics.